The Seaman to Admiral – 21 was designed to combine a number of commissioning programs into one. With this new program, enlisted Sailors are given the opportunity to receive a commission while maintaining the benefits of being active duty. Sailors receive up to $10,000 per year for books, fees, and tuition. Upon graduation, Sailors will receive a commission. The STA-21 Program is for active duty Sailors which allows them to return to an accredited college for up to 3 years to complete their degree before accepting a commission in the United States Navy. OSU is an accredited school for Core, Nuke, and Pilot options for Officer Candidates (OC). The Navy allows up to $10,000 per academic year for books, tuition and fees. Oregon State University is on the quarter system, so students should plan for approximately $2500 per term (not including fees). Calculators, pens, pencils and notebooks are not reimbursable. The NROTC unit does not cover the upfront cost of books, but you may be reimbursed if you submit your receipts. Also, a new requirement for the College of Engineering is that all incoming freshmen and transfer students must have a laptop with wireless capabilities. Exact specifications for Engineering computer requirements can be found on their website. The STA-21 program will not reimburse for this purchase, so please plan accordingly. OCs are strongly encouraged to fill out FAFSA forms to apply for scholarships through OSU Financial Aid, and independent sources. Be sure to fill out the information accurately and account for ALL income and funds received from the Navy, including the $10,000 scholarship and BAH/BAS. Failure to supply this information during application for need-based financial aid is considered fraudulent. For information regarding family resources on campus, please check out the Oregon State University Childcare and Family Resources page, or give them a call at (541) 737-4906. 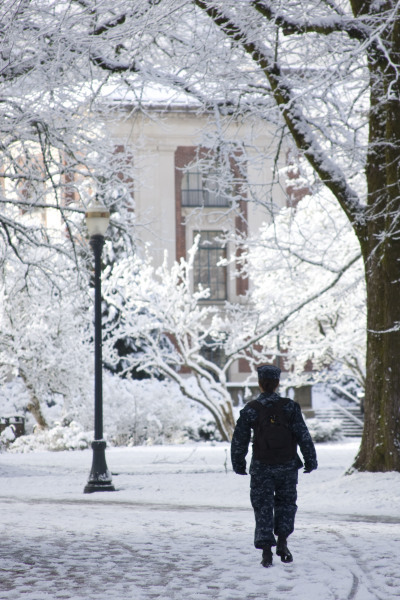 At Oregon State University active duty sailors are fully integrated within the Battalion. They participate in weekly physical training, battalion drill and labs, as well as holding positions within the battalion chain of command. Various billets are assigned to OCs, and their midshipmen counterparts, in order for their professional development and leadership skills. Please email our Submarine Officer with any further questions you may have. The appearance of external hyperlinks does not constitute endorsement by the United States Department of Defense, the United States Department of the Navy, the linked web sites, nor the information, products or services contained therein. For other than authorized activities such as military exchanges and Morale, Welfare and Recreation (MWR) sites, the United States Department of Defense, the Department of the Navy does not exercise any editorial control over the information you may find at these locations.